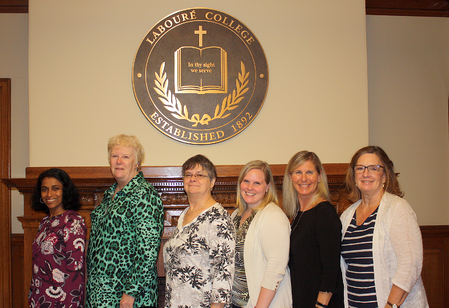 Last Thursday, HIT Chairperson Elise Belanger hosted the Labouré College Medical Coding Grad Network dinner for Fall 2018. Professional networks are important to career success; networks can help you find a new direction to take, a better job, or just open communication with others in your profession. Different people use them in different ways, but it is wonderful to know that other colleagues are available when you may need them. The Medical Coding Grad Network was founded by Class of 2014 graduates from the College’s Medical Coding program, who wanted to continue to meet after graduation. They proposed the idea of a group meeting to HIT Chairperson Elise Belanger. Since then, Elise has been calling the group together at various points throughout the year to discuss different topics and to have the opportunity to network with each other. Last Thursday’s topic was the variety of specific jobs that use their coding skills today. With so many new positions that are trending in the industry, it is important to talk about what’s coming next and to strategize about new career goals. Pictured from left to right: Annie Bheecham, Ellen Mitchell, Barbara Bowe, Jennifer Johnson, Tina Cloutier, and HIT Chairperson Elise Belanger. Click here to learn more about the Medical Coding program. Already a Coder? Take the next step with training in Clinical Documentation Improvement. Did you graduate from the Medical Coding program and want to join the Grad Network? Contact Elise for more information.